Reach 22000 points within 120 seconds to complete the level. This level have again time requirement and this candy board have 27 grill boxes that you need to break fast as possible to make candy board more big and get chance to make more special candies. Some special candies that you can make is colorbomb which you can get by combing five same color candies or striped candy by combining four same color candies and wrapped candy by making ‘L’ or ‘T’ shape of candies. The strategy you need to use is try to break grill box in start and as board start to get bigger try to focus on special candies and breaking special candies or using special moves will break so many candies in a single move plus will break time bonus candies will help to add more time on a timer. Some special moves you can use is combining colorbomb with striped candy will convert all same color candy to striped candy and combining wrapped candy with striped candy will break 3 rows and columns. 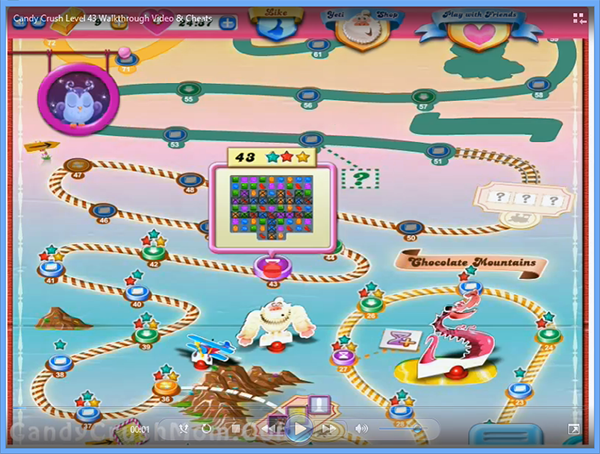 We completed this level with 299220 score by using more special candies and moves and in end some candies converted to striped candy that helped us to make three star score.